While a humpback whale and her calf surface for air, majestic killer whales chase their prey, a pod of dolphins plays in front of a stunning sunset and several shark fins mysteriously break the surface of the waves. No, this is not a gaudy daydream, but an image of the ocean my young self created while growing up in landlocked Switzerland. Countless drawings like this from my childhood depict my early fascination for marine life, especially the large mammals. Years later, I am a doctoral student working passionately with sharks and I wonder why only their fins appeared in my paintings. Were sharks too difficult for a nine-year-old to draw? Or did I leave them hidden on purpose, so I could discover these amazing creatures at a later stage in my life? Fourteen years later and having completed a BSc degree, in October 2009 I found myself snorkelling in the crystal-clear turquoise waters of the Bahamas within a group of Caribbean reef sharks while the famous Dr Samuel ‘Doc’ Gruber watched from a nearby boat. Yes, I am at the world-renowned Bimini Biological Field Station (also known as the Shark Lab) and yes, living there was the turning point in my life! After a two-month internship at the Shark Lab, I returned to Switzerland and cancelled my enrolment in a cell biology MSc programme and a project at a laboratory for infectious diseases. I moved out of my apartment, focused on a graduate programme in animal biology and purchased a plane ticket back to Bimini. 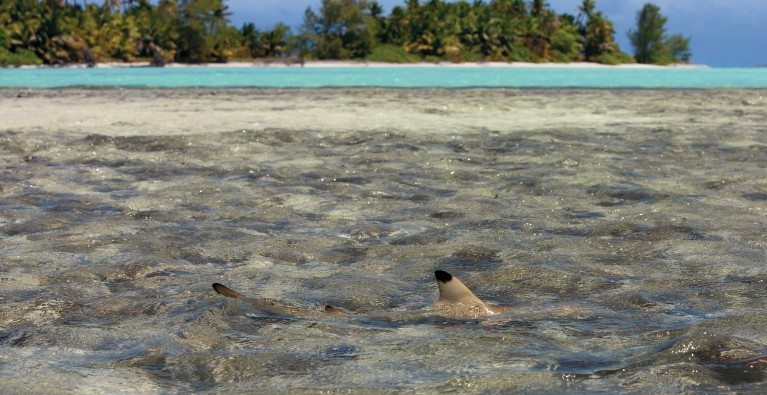 On my return to the Bimini Biological Field Station in early 2011, I dedicated my time to my research project, in which I examined the diet of juvenile lemon sharks and the effects of anthropogenic habitat destruction on their diet. Through the application of stomach eversions (a non-invasive method in which the stomach of an unconscious shark is gently pulled out of its mouth) I was able to determine what the juveniles had been eating. While most people would be disgusted by smelly, half-digested fishes and crabs, my interest in sharks, especially juvenile sharks, became even more intense. During my seven-month tenure at the Shark Lab I acquired in-depth knowledge of the biology and ecology of sharks by also assisting with several other projects. In most cases the information came from the highly experienced Shark Lab members right there in the field, but I would extend and deepen what I learned from them by studying books and papers back on shore. From the practical perspective, there was much else that I learned about capturing and studying sharks, such as how to track juvenile lemon sharks acoustically in their shallow, mangrove-fringed nurseries; how to check long-lines throughout the night; how to catch large tiger sharks from the depths of the Gulf Stream; and how the endless scraping of fish carcasses can eventually attract hammerhead sharks. I absorbed every bit of information available. And whenever a Bahamian day ended and we were returning to the Shark Lab after a long, arduous day in the field, I would watch the setting sun. I realised how happy and fulfilled I was and decided that I would pursue my passion and become a marine biologist.